On his first day on a new job DCI Tom Mathias investigates a blood-soaked bathroom and the disappearance of 64 year old Helen Jenkins. The inquiry focuses on an old Children's home above the ravine spanned by the Devil's Bridge. 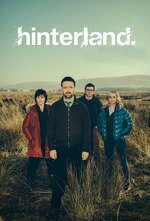 A dark, wintry procedural with good-looking ciphers investigating, Hinterland is the latest entry in a wave of Northern European mysteries like The Killing, Wallander, etc. This show was produced in both English and Welsh by the Welsh national broadcaster. I was only able to watch the English version of this show on Netflix, but MeFi's Own languagehat has a link to a clip with Welsh footage on his blog post. minor spoiler in languagehat's video link. I thought that this was perfectly decent for a Saturday doing housework, but really not appointment tv. I would have liked to get to know the rest of the team better; I felt like the show suffered from concentrating on the lone wolf, angsty tragic-past chief investigator trope, which has become kind of tiresome to me. But that could be because I watch way to many of these types of shows. I think that's a fair point and I hope they do show more of the other investigators. There's some kind of hostility between the two women detectives. I'm a fan of anything Welsh and was just in awe of so much of the scenery. I'll be watching more to hopefully get some back story on the characters, but also for the views.